Michigan peaches are in season at my local farmer's market and let me just say that, this year, they're amazing! Oh My Gosh! Have you tasted this summer's peaches!? Today, I'm grilling some summer peaches with a little maple syrup glaze...and serving them with toasted pecans. 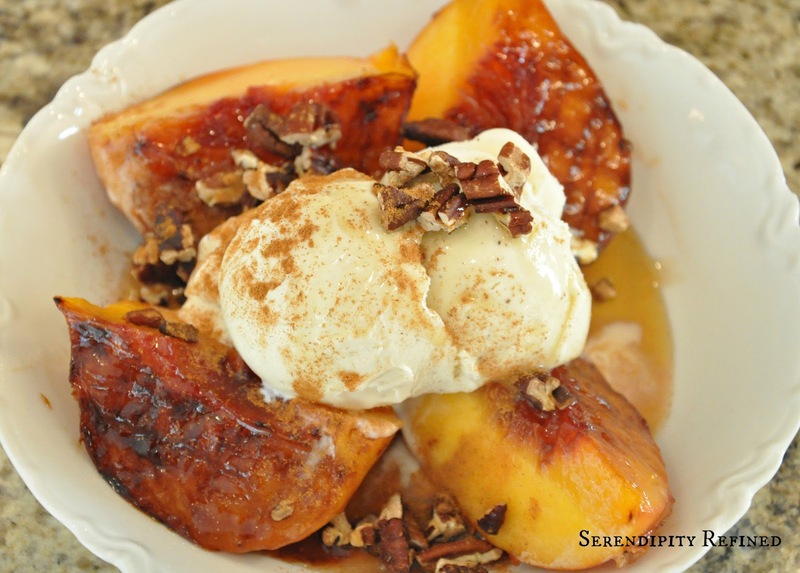 If you're a fan of peaches and of quick and easy summer desserts like I am, then this recipe is for you! What could be simpler than grilling a few summer peaches to serve with your next meal!? Either on the grill or in the kitchen on a griddle or Panini pan, if you've never grilled fruit, try it, I think that you'll be surprised at how easy it is. To make them, you'll really only need three ingredients: fresh peaches, one to two tablespoons of butter and maple syrup. 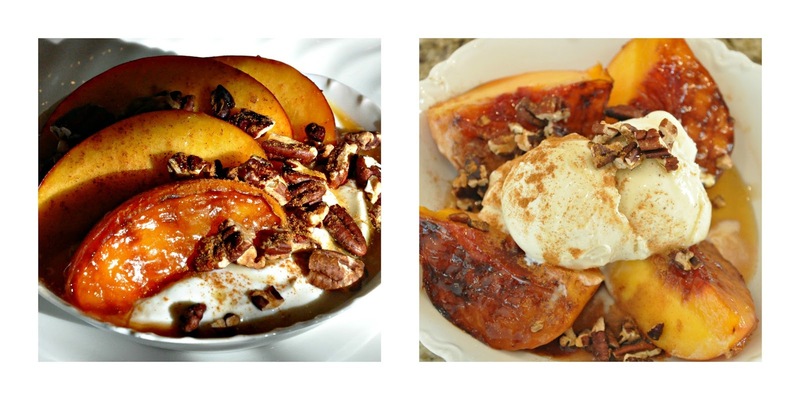 Pecans and Cinnamon are optional...but I never grill peaches without them! First, wash the peaches and pat them dry. Then, using a sharp knife, cut the peaches in half and remove the pits. Next, brush the face of each peach half with maple syrup. 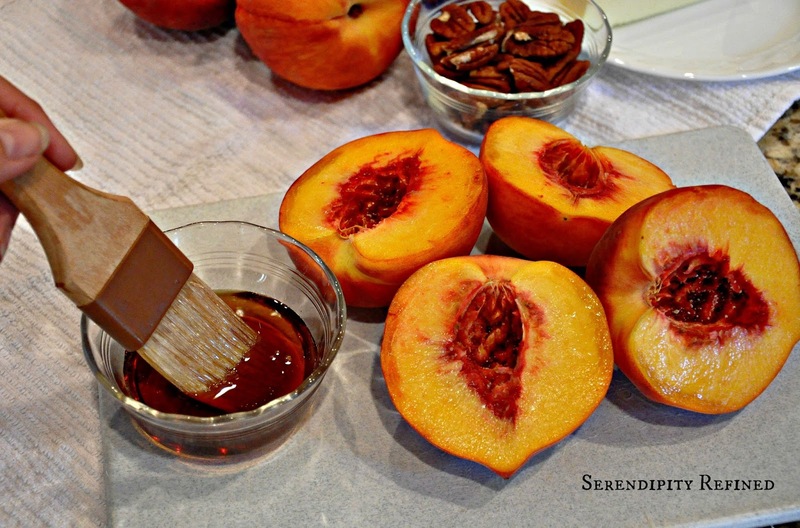 This helps to add moisture in the peaches and the sugar caramelizes slightly when you grill it which is just plain yummy. Over medium high heat, melt about 1 tablespoon of butter onto a griddle (or into a panini pan if you're in the middle of moving and your griddle is already packed). 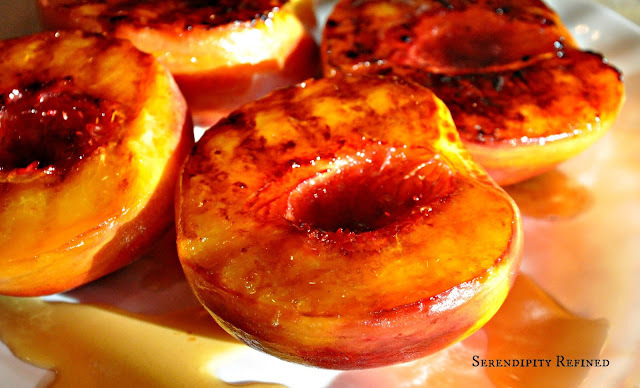 Place peaches, cut side down, into the pan and grill them for about four minutes. 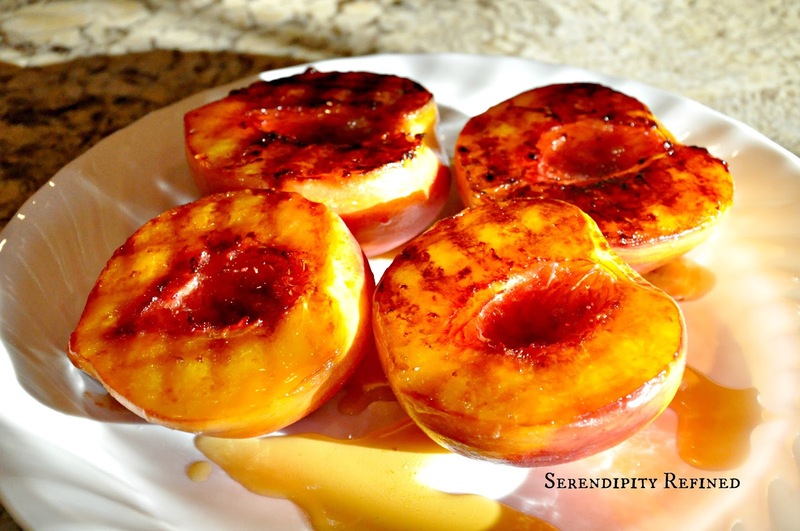 After three to four minutes, rotate the peaches one quarter turn and continue to grill them for another three to four minutes. This makes pretty grill marks on them and, after all, grill marks do make fruit taste better. Trust me, there was probably a study conducted about grill marks and their impact on the flavor of fruit...I'm almost certain that I read it some where on the Internet. Okay, maybe not but they do look amazing when you serve them to your family and friends. See what I mean?! While the peaches are grilling, grab a hand full (or two) of pecans, toss them on the cutting board and coarsely chop them. Place them on a cookie sheet and toast them in a 350 degree oven for a few minutes. Stir them after a couple of minutes to make sure that they don't burn. Wash peaches and pat dry. 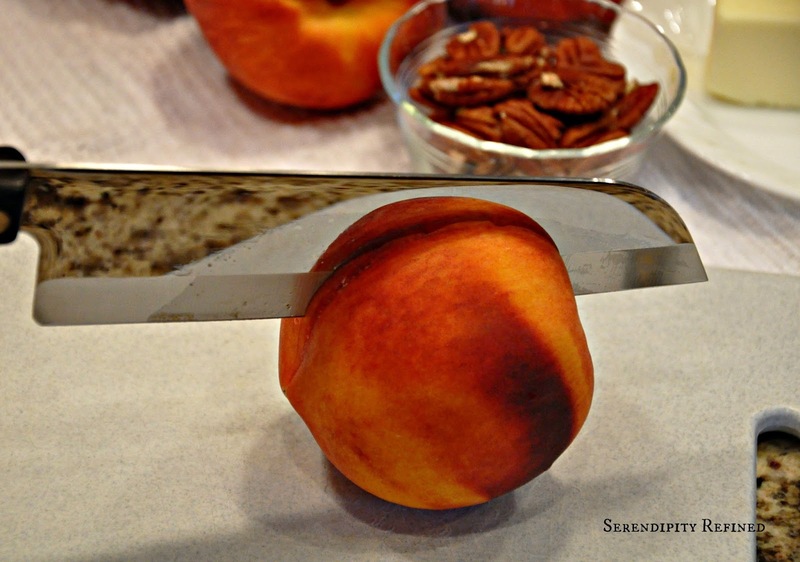 Using a sharp knife, cut peaches in half and remove pits. Brush cut side with Maple Syrup. Using a griddle, over medium high heat, melt 1 tablespoon butter. 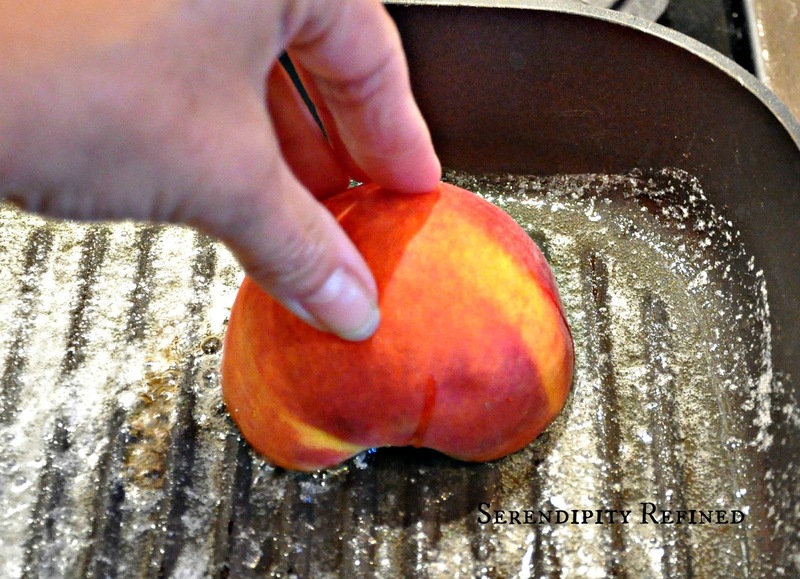 (NOTE: if you're doing this on the grill, rub the butter on the grill at the outside edge, away from the flame) Place peaches into the pan, cut side down. Grill for three to four minutes over medium heat. Rotate 1/4 turn and continue to grill for an additional three to four minutes. Preheat oven to 350 degrees. 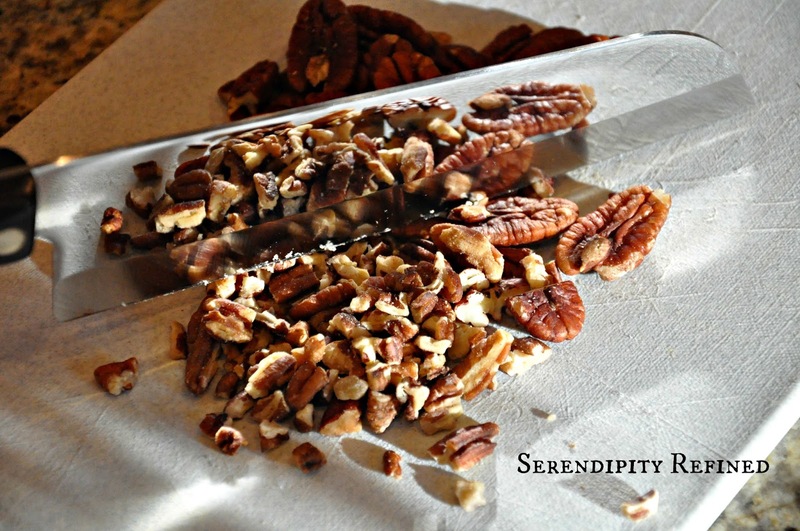 Coarsely chop pecans and place them on a baking sheet. (NOTE: if you're doing this on a grill, place them in a skillet over the fire and toast them for a few minutes,stirring constantly) Toast them in the oven for about 4 minutes, stirring them about half way through. 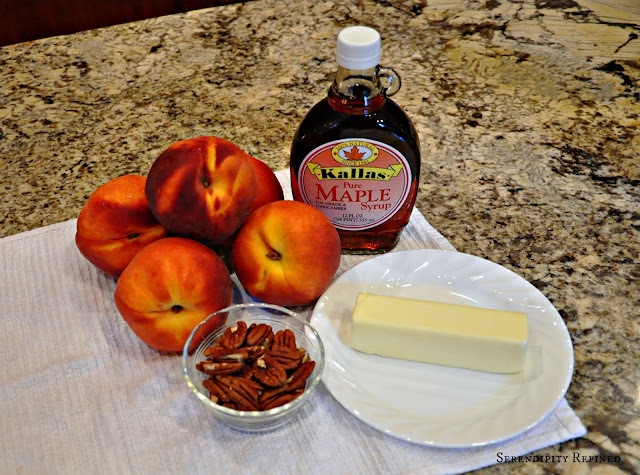 Remove Peaches from heat and drizzle with additional maple syrup. Place 1 cup Vanilla flavored Greek yogurt into a bowl. Slice the peach half into quarters. Press the peach slices into the yogurt, drizzle with maple syrup, sprinkle with nuts and a dash of cinnamon. Place peach halve(s) into a bowl, top with a scoop (or more) of vanilla ice cream, drizzle with maple syrup, sprinkle with nuts and a dash of cinnamon. Eat them with only the nuts and cinnamon, while they're still warm. 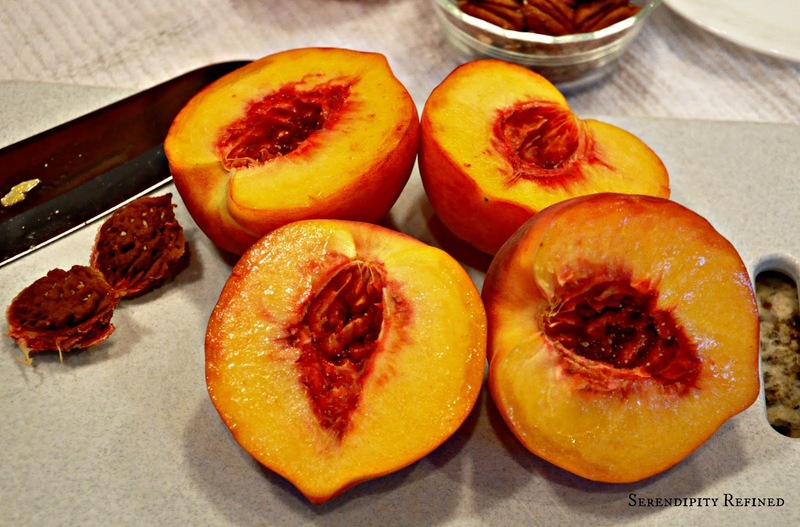 Allow the peaches to cool , chop them and add peaches and nuts to salad. 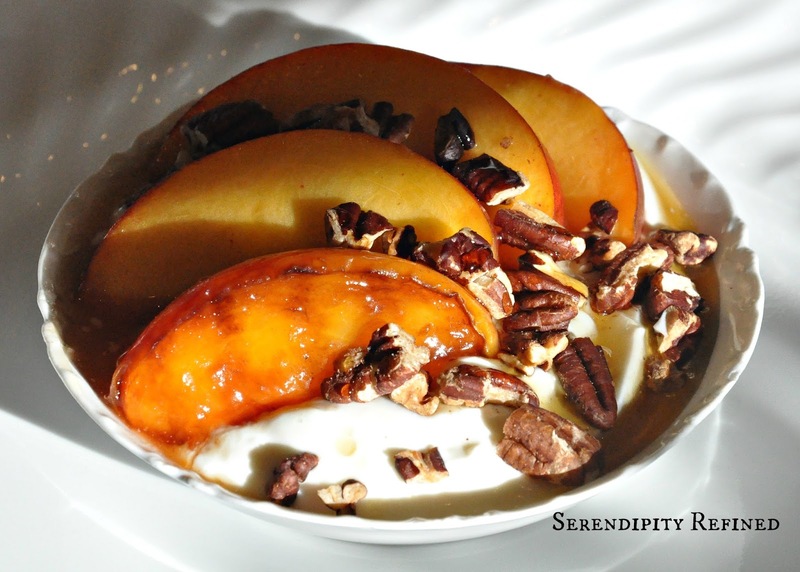 No matter how you serve them, grilled peaches with maple syrup glaze and toasted pecans are a quick and easy summer treat!